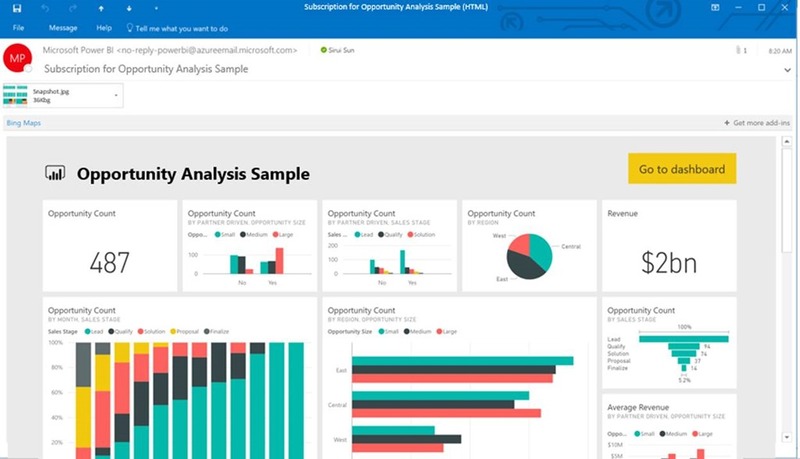 Earlier this year, we announced public preview of e-mail subscriptions for report pages in Power BI. Since then, we’ve sent hundreds of thousands of emails to our users, informing them of changes to critical data right as it happens. Intrigued? Read on for more details. Or, head directly to your favorite dashboards to set up your own subscriptions. Have feedback? We’d love to hear it. Go to the community forums and make your voice heard! To get started, navigate to a dashboard and select the new Subscribe icon. Note: Like report page subscriptions, dashboard subscriptions requires a Pro license. From there, simply select how often you’d like to receive emails, and you’re done! You will now receive emails with snapshots of the dashboard whenever any of the underlying datasets refreshes – though no more than once every 24 hours. Tip: If you’re an owner of the datasets underlying the dashboard, you can trigger a refresh on those datasets to immediately get the subscription email. You can do this without ever leaving the dashboard using the view related content feature. We’re super excited to see what you can accomplish with dashboard subscriptions. On top of this, we have many further improvements planned to email subscriptions as we progress through public preview. These include subscribing others to emails, subscribing to reports with specific slicer and filter states set, as well as subscribing to content from Power BI apps. Excited about the future? Please vote on the associated UserVoice ideas to help us further prioritize our work!